Washington, D.C. | October, 2017 — The American Antitrust Institute (AAI) named Kellogg, Hansen, Todd, Figel & Frederick, P.L.L.C. a 2017 Antitrust Enforcement Awards honoree for "Outstanding Antitrust Litigation Achievement in Private Law Practice." Kellogg Hansen was chosen for successfully representing six corporate class representative clients in The Dial Corporation, et al. v. News Corporation, et al., Civ. Action No. 13-CV-06802 (WHP) (S.D.N.Y). Steven Benz, Kellogg Hansen partner and co-lead counsel, will accept the award on behalf of the firm. In this Sherman Act monopolization case involving in-store promotions, Kellogg Hansen represented the Dial Corporation, Henkel Consumer Goods, Inc., Kraft Heinz Foods Company, H.J. Heinz Company, L.P., Foster Poultry Farms, Smithfield Foods, Inc., HP Hood, LLC, and BEF Foods, Inc. On the first day of trial, Mr. Benz secured a settlement of $250 million and significant injunctive relief for both his clients and the certified class of 699 consumer product goods (CPG) companies. Kellogg Hansen will be honored along with co-counsel, Susman Godfrey L.L.P., McKool Smith PC, Kramer Levin Naftalis & Frankel LLP, and Berry Law PLLC. 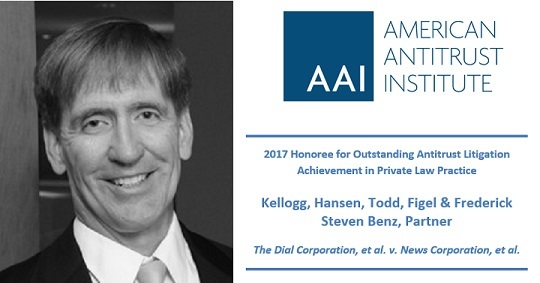 The honorees will be recognized at the AAI gala dinner on Tuesday, November 7, 2017, following the AAI’s Annual Private Antitrust Enforcement Conference.